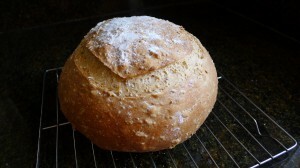 In a previous post dated Feb. 5th, 2012, I lamented about having a problem w/ my bread bursting at the slash point. Well, the problem has been solved! The bread in the photos above was made when the ambient temperature in my kitchen was 72 degrees F.
I think it may have been that during the colder months I didn’t proof the bread long enough before popping it in the oven. I did some research and it points to underproofing because in the warmer months I don’t have this problem. Someone suggested it was possibly due to the way I was shaping my loaves, however I shape the bread the same in both cold and warm months so I think not letting the dough proof long enough during the colder months is the culprit. It makes sense because dough takes longer to ferment and proof in lower temperatures and my kitchen was around 64 degrees F when I was baking during the winter. 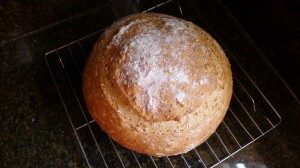 Celebrating beautiful (and crack free) bread! !